“Elon Musk” scams are invading people’s Twitter timelines again, Business Insider reports. 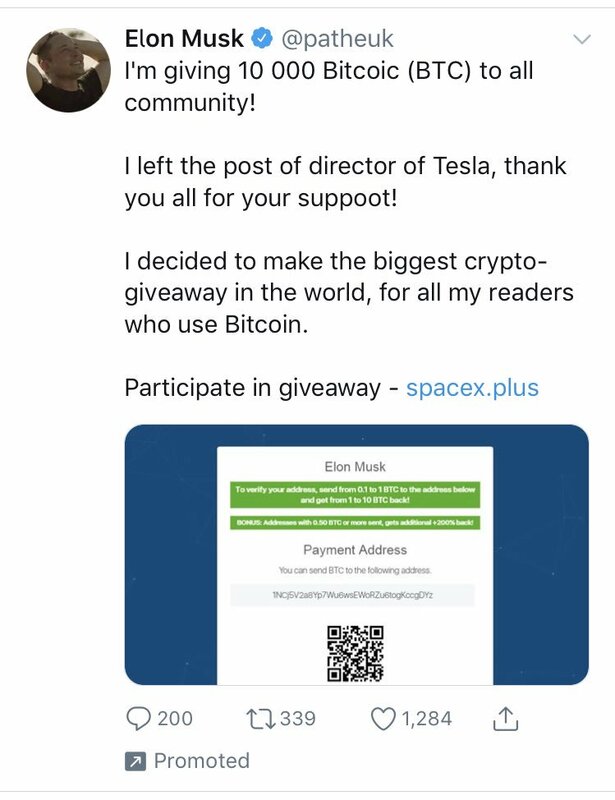 Announcing he’s left his CEO position at Tesla, Musk is all of a sudden feeling generous enough to hand out digital currency to random people on Twitter. Better said, the fake accounts claim to be giving out “Bitcoic” by inviting followers to participate in a fake cryptocurrency giveaway. Cryptocurrency scams have gained popularity and show no sign of slowing down. Hackers are now even promoting them through Twitter’s ad service. How do they work? Trying to make a quick buck off the cryptocurrency mania, hackers compromise legitimate accounts. Accounts known to have been hacked are Pantheon Books, film production company Pathe UK and US, and politician Frank Pallone Jr, for a few examples. Then the hackers change account names and pictures, and start tweeting their scams, sometimes by infiltrating Musk’s mentions. Now, thanks to the sponsored ads, they are visible on people’s timelines. And they must be working, as one account has allegedly raised some $170,000. Since these scams started, Twitter has been trying to take them down. The company has come up with strategies to prevent accounts from getting major changes, such as blocking name changes. Obviously, they have to keep working on it as it hasn’t proven very successful so far.